Jeep has started the production of the 2008 model of the Jeep Liberty, a four-door SUV model that was introduced in 2002. Jeep Liberty raced up the charts as the best-selling compact SUV in the United States and was further named as the North American Truck of the Year for that year. Diesel-powered, medium-sized, this SUV boasted of much promise that the launch of its 2008 model is now awaited for. What was it about the older Jeep Liberty models that sent the cars raking in sales? The Jeep Liberty offers three different trims: The Jeep Liberty Sport, Jeep Liberty Limited, and Jeep Liberty Renegade. It is well-known for these trims that anyone can choose from to suit their taste and preference. In 2004, a special Jeep Liberty Columbia Edition trim, was released and is now a collectible vehicle today. The Jeep Liberty is also known as another Jeep Trail Rated vehicle that can handle any off-road condition. All Jeep Liberty models are equipped with Hill Start Assist (HSA) that smoothens out launches, and an Anti-Brake System with Rough Road Detection. The Jeep Liberty also has two four-wheel drive systems, the Command-Trac® and the Selec-Trac® II. The vehicle sounds excellent enough, but Jeep is now banking on the Jeep Liberty’s promise and setting up the platform a bit higher, with the release of the new 2008 Jeep Liberty. Probably the most distinguishable change is the roughening up of the Jeep Liberty. The rounded look will now replaced with a chunkier look with square headlights, making it look like a retro, classic Jeep coming back from the past. The stockier model also has interior advantages, with increased storage and seating space for more comfort. With a new Sky Slider™ full-open canvas roof, riders will now experience the Jeep Liberty in a totally different way: open air. The 2008 Jeep Liberty will also be powered with a remote start, a cargo slide-out system, and stability control with roll prevention. It will also be furnished with the Hill Descent Control (HDC) that is typically found in 4x4 models but is an entirely new addition to the Jeep Liberty line. Modern electronics have found its way into the making of the 2008 Jeep Liberty, born during this age of digital electronics. Aside from its usual Jeep appeal, adventure-seekers and off-road drivers will now be entertained with the great gadgets that Jeep Liberty can offer. The MyGIG Multimedia Infotainment System™, for instance, is an audio, entertainment, navigation, and phone system with touch screen and voice command prompts for control. Jeep Liberty riders may listen to music and browse through digital photos, with the sunroof opened, air breezing inside the vehicle as they blazed through the road. It also includes a 20GB hard drive to store music and photos. The 2008 Jeep Liberty’s wipers are also not ordinary wipers; they can automatically sense wetness to activate. Aside from a remote start, Jeep Liberty also has a remote keyless entry feature. To complete the whole package, the 2008 Jeep Liberty is packed with security features for maximum protection. Advanced multi-stage airbags, auto-reverse sun roof and windows, belt alert, brake/park interlock, child-protection locks, Enhanced Accident Response System (EARS), knee bolsters, and interior head-impact protection are just some of the security features that potential buyers of the 2008 Jeep Liberty will be fortunate to have. These security features are considerable upgrades to the last Jeep Liberty 2006 model. 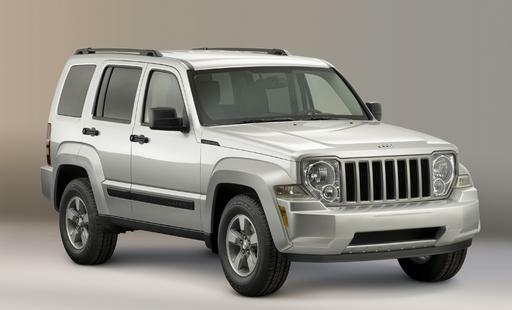 As the launch nears, the 2008 Jeep Liberty raises a few eyebrows, due particularly to its squared-off look. With the existing Jeep Liberty models doing so good, people are asking why Jeep would think to make such a dramatic change from a curvy look to a blockier style. There is also a particular concern about most of the Jeep Liberty buyers being women, whereas the 2008 Jeep Liberty undeniably looks more masculine. In response to this, the 2008 Jeep Liberty may just be trying to break free from this niche. With the latest changes, the 2008 Jeep Liberty is targeted toward young couples and new families who are looking for an SUV with off-road capability, without sacrificing the comfort and convenience. The gadgetry and excellent off-road capability of Jeep Liberty will also appeal to young professionals, both men and women, who are balancing between a practical, convenient lifestyle and their edgy enthusiasm for adventures. Prices have been announced, and there have been previews of the 2008 Jeep Liberty. The stage is set for the arrival of the new model. As the anticipation mounts, the question is, will it match the success of its predecessors? And, of course, will it be worth the wait?